A shocking 146 billion coffee cups are discarded annually in America alone, and since most of those cups have a polyethylene lining, they can’t be recycled. It’s no wonder that we’ve seen initiatives such as Keep Cup and Good to Go looking to cut paper waste through reusable cups that can be bought or even rented. Now, Reduce. Reuse. 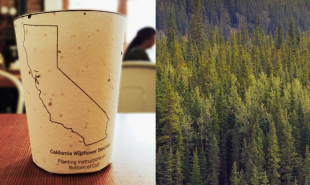 Grow have developed another eco-friendly option in the Plantable Coffee Cup — a 100 percent biodegradable cup with native seeds embedded in its material, meaning it can be planted after use to help with local reforestation. The Plantable Coffee Cup is made from recycled paper, sourced from local recycling centres in California. It has native seeds embedded within the material and a description of the seed variety and planting instructions printed on the cup. After using, the consumer can choose to plant the cup within their community to enhance their local urban and rural landscapes. They simply unravel the cup and soak it in water for five minutes before planting. Alternatively, it can be disposed of safely and it will biodegrade within 180 days, releasing its nutrients for other plants to enjoy. Each cup costs USD 0.02 to produce, which is the same as a standard biodegradable cup, and USD 0.01 more than a Solo cup. Reduce. Reuse. Grow hope to supply their product to eco-conscious coffee shops around the world, but they are currently concentrating on their home state of California. They will provide special trash cans to participating stores so that they — or third parties such as landscape companies or non profits — can collect used cups for reforestation purposes. The Plantable Coffee Cup is currently crowdfunding on Kickstarter. Are there other products which could be transformed from waste to nourishment in this way?